that’s how the locals say ‘Spokane‘. They don’t say ‘Spo kane’. This weekend Flat Eric is taking me to a turn of the century (1908) Spokane city ‘Registered Historic Landmark’ Bed and Breakfast, Stoltz House, Oh Yeah Baby! Spokane was the smallest city to host a World fair. The first World fair with an ‘environmental’ theme inspired by concerns about mining poluting the local river. Growing awareness of the local regional nuclear contamination attributed to the Hanford facility may have played a role. Hanford is within 150 miles of Spokane. Wikipedia mentions that Hanford is known for being the site which supplied the nuclear material for the ‘Manhattan project’ and the bomb dropped on Nagasaki. We’ll be spending a few moments in silent contemplation overlooking Hanford on Memorial day. Apparantly much of the original site is now ‘orchards’. Hmmmmm… Washington apples, distributed all over America. I once accidentally drove onto the current Hanford site and was promptly acosted by a military person waving a BIG gun. “Sorry sir, it was such a nice big road and so empty I thought it was a ‘toll booth’ not a military check point“. I suspect a convincing ditsyness, it being Christmas Eve, my ‘cute’ English accent and Flat Eric wearing his seat-belt in the passenger seat helped me get out of that without an interrogation. 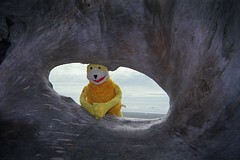 Flat Eric will be in the passenger seat again on the way to Spokane; it has free city-wide wireless service. YAY! that suits this online girly, Darling will be coming with me downtown! This scribble was published on Friday, May 26th, 2006. You can follow any banter on this scribble with the RSS 2.0 feed. You can leave a response, or trackback from your own site.